Advantages: Ideal format for modeller's reference; logical structure by aircraft type; more than 100 full-colour photos; 78 colour profiles/plans plus many colour scrap views of nose art, bomb logs and aircraft names; profiles include ordnance variations; all profiles usefully captioned; succinct but interesting text; tie-in with future decals. What does a modeler need in a reference book? How about large colour photos of the subjects including details of nose art, mission logs and special markings; a large number of colour profiles with captions and scrap view detail drawings. Oh, and wouldn't it be nice if you could get decals for all those mouth-watering potential modelling subjects? 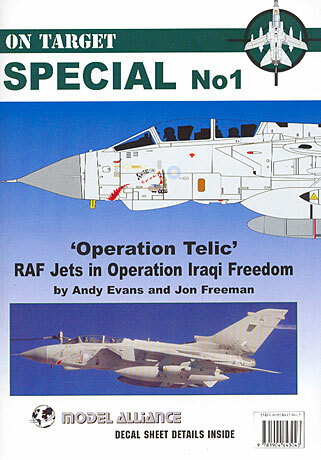 Model Alliance's On Target Special No.1 "Operation Telic" RAF Jets in Iraqi Freedom delivers all of the above. This new book is presented in soft cover format with 48 pages on full-colour, glossy paper. The text is succinct and interesting, but the real stars in this book are the photos and colour profiles. Jon Freeman, who will be well known to many HyperScale visitors, is responsible for the profiles. Operation Telic was the British code name for its participation in Operation Iraqi Freedom. Telic is derived from the word for "purposeful" in Greek, but the book relates one RAF wit suggesting that it stood for "Tell Everyone Leave Is Cancelled"! This style of ironic humour is also carried on to many of the subject aircrafts' nose art. The book is organised by aircraft type, starting with the Tornado GR.4 and GR.4A, moving on to the Tornado F.3, Harrier GR.7; Jaguar GR.3; and even small sections on the Canberra PR.9 (still operating halfway into its fifth decade of front-line service) and Nimrod MR.2P. The coverage is rounded off with a colour chart. The small, process-printed colour chips are of limited use, but the BS 381C and FS Number references combined with a description of use are very helpful indeed. This publication has undoubtedly benefited from the age of digital photography where every second service person would have a 3 megapixel camera in their pocket. Well over 100 photographs are included of aircraft and their details, with particular attention to unique markings - nose-art, bomb logs etc. In the vast majority of cases, the serial number and codes of the aircraft are included with the photograph. This will make it a simple matter to reproduce accurate and interesting models based on the photographs. 78 colour drawings are also included. The greatest coverage is devoted to the Tornado GR.4/4A due to the number use in the operation, and owing to the great variety of unique artwork applied to the airframes. Jon Freeman has included scrap-view diagrams accompanying the profiles showing detail of this nose art. One aspect that I particularly liked about the drawings is that they also portray a wide variety of ordnance, with many different loadouts and even different colours for similar weapons. Except for the Canberra and Nimrod, all aircraft subjects are grey. Desert Sand was not required for camouflage this time around because these ground pounders were operating at higher altitudes. Instead, Tornados and Jaguars received a new coat of overall light grey ARTF (Alkaline Removable Temporary Finish) just before deployment, resulting in a very clean appearance for the short duration of the operation. Model Alliance will also be releasing two decal sheets that cover many of the interesting Tornado and Harrier subjects in this book. On Target Special No.1 "Operation Telic" strikes a balance between brief text, captioned photos and attractive profiles that is, in my opinion, ideal for the modeller. I hope that we see more books in this format from Model Alliance.